3. What is one example of a physical layer problem? • Record the information about the devices discovered in the Campus network only. • Record the information about the devices discovered in the entire network, including the remote locations. • Transfer any information about the devices from the network configuration table that corresponds to a component of the topology diagram. • Transfer only the Layer 2 and Layer 3 information about the devices from the network configuration table that corresponds to a component of the topology diagram. • Transfer the recorded information about the devices from the network configuration table gathered during peak network utilization that corresponds to a component of the topology diagram. • TCP/IP splits the lowest layer of the OSI model into two separate layers. • The top layer of the TCP/IP model combines the functions of the top three OSI layers. • Troubleshooting with the TCP/IP model requires different techniques than with the OSI model. • The network access layer is responsible for exchanging packets between devices on a TCP/IP network. • The Internet layer provides communication between applications, such as FTP, HTTP, and SMTP on separate hosts. • The TCP/IP network access layer corresponds to the OSI physical and data link layers. 7. Clients across the company are reporting poor performance across all corporate applications running in the data center. Internet access and applications running across the corporate WAN are performing normally. The network administrator observes a continual broadcast of random meaningless traffic (jabber) on the application server LAN in the data center on a protocol analyzer. How should the administrator start troubleshooting? • The jabber in the data center indicates a local physical layer problem. Use the protocol analyzer to determine the source of the jabber, and then check for a recent NIC driver update or bad cabling. • application servers in the data center. 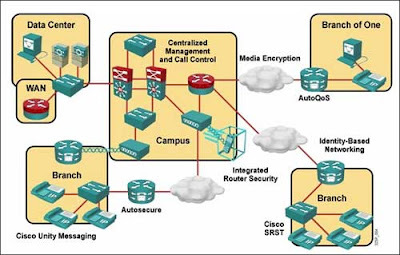 • The scope of the problem indicates a likely routing or spanning-tree problem. Begin by checking routing tables, and follow up using appropriate STP show commands to find a loop if routing is working normally. • Poll the staff to determine if any recent changes have been made. Back out all the changes one by one until the error condition is fixed. 8. Which troubleshooting approach is suggested for dealing with a complex problem that is suspected of being caused by faulty network cabling? 9. A technician has been asked to make several changes to the configuration and topology of a network and then determine the outcome of the changes. What tool can be used to determine the overall effect caused by the changes? 10. A technician has been asked to troubleshoot an existing switched network but is unable to locate documentation for the VLAN configuration. Which troubleshooting tool allows the technician to map and discover VLAN and port assignments? Refer to the exhibit. Users on the Internal LAN are unable to connect to the www server. The network administrator pings the server and verifies that NAT is functioning correctly. Which OSI layer should the administrator begin to troubleshoot next? 12. When gathering symptoms for troubleshooting a network problem, which step could result in getting an external administrator involved in the process? • A carrier detect signal is present. • Keepalives are being received successfully. • Default encapsulation is used on this serial link. • Packets passing this interface cannot exceed 1 KB in size. • The reliability of this link is very low. • The LCP negotiation phase is complete. • The web server should be tested for an application layer problem. 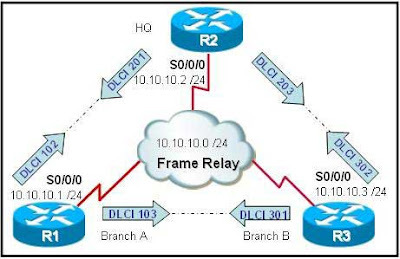 • Frame Relay at R3 and R2 should be tested to narrow the scope of the problem. • The fact that users at Branch A are working normally proves that there is no problem at R2. • An ACL entry error could cause the failure at Layer 4 in either R3 or R2. 15. Users are complaining of very long wait times to access resources on the network. The show interface command reveals collision counts far above the network baseline. At which OSI layer should the administrator begin troubleshooting? 16. Encapsulation errors from mismatched WAN protocols on a serial link between two routers indicate a problem at which OSI layer? 17. What combination of IP address and wildcard mask should be used to specify only the last 8 addresses in the subnet 192.168.3.32/28? 19. Information about which OSI layers of connected Cisco devices can be verified with the show cdp neighbors command? • Get to know the user to build trust. • Obtain information by asking simple pertinent questions. • Impress the user with use of technical language and skills. • Determine if the problem is related to time or a specific event. • Determine if the user can re-create the problem or events leading to the problem.